We’re all familiar with the traditional braces system that features metal wires, dark brackets, and brightly colored rubber bands. While this treatment may be the right choice for children in middle school, older patients are likely to shy away from it because of the aesthetic sacrifices involved. After all, the last thing you need when you’re trying to maintain a polished, professional appearance is a mouthful of metal! Thankfully, Dr. Thomas Dolan and Dr. Brendan Dolan offer a much more attractive alternative that can help you achieve the mild to moderate orthodontic improvements you’ve always wanted: Invisalign. If you’d like to schedule an Invisalign consultation here in Wethersfield, please give Dolan Dental a call today. Invisalign treatment eliminates the conventional braces model entirely, replacing it with clear, custom-made aligners. Each patient will receive a series of these aligners, with each one representing a different stage of their smile’s ongoing improvement. The patient’s job is to wear their aligner at all times (except when eating, brushing, or flossing) and switch between aligners as directed (typically every couple of weeks) until they’ve completed the treatment plan. You will also need to attend regular checkups with our team so that we can gauge your progress – no uncomfortable tightening needed! Because Invisalign aligners are clear, they blend in well with your natural smile when worn. In fact, it’s likely that most people won’t even notice you’re wearing them, allowing your true appearance and confidence to shine through. The aligners are also removable, which means that patients can continue to enjoy all of their favorite meals without restraint! They can brush and floss like normal as well for added convenience. 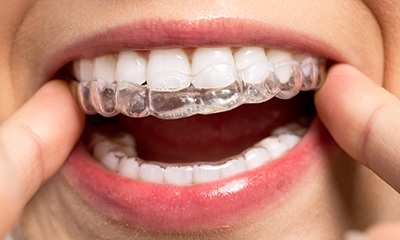 There are no irritating wires to worry about with Invisalign. The high-quality plastic material of the aligners is smooth and custom-made to suit your unique mouth. Most patients complete Invisalign treatment in just 8-18 months, which is a big improvement over the multiple years that traditional braces can often require.